There are a couple of tee shots at the Augusta National Golf Club that consistently challenge me - number 10 and number 18. Each is a long, tight, doglegging par four, and on each hole I've hit my share of poor tee shots. On holes such as these, my goal is to stay loose and relaxed - to prevent the difficulty of the shot from transferring to my body in the form of tension and tightness. As I wait on the tee, I close my eyes, take a deep breath, and then slowly tilt my head from side to side, lowering my right ear to my right shoulder, my left ear to my left shoulder a few times. In fact, I do this on the first tee of every tournament. Seve Ballesteros has a tension-relieving method of another sort. It's a bit masochistic, but I'm sure it works. He folds his arms, takes a deep breath, and then presses his hands hard against the bottom of his rib cage for about fifteen seconds. When he lets go and exhales, he has a great feeling of release and relaxation. This carries over to his shot. 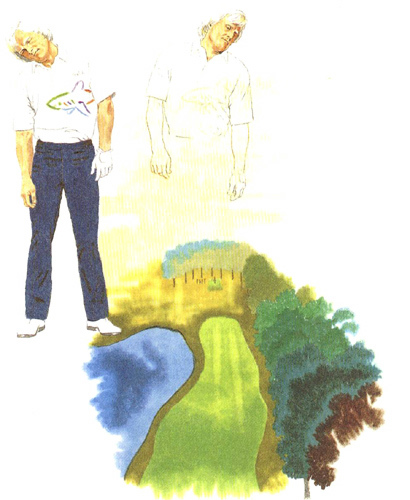 I see other players who let their arms drop straight down and then shake them so that their hands flap around at the wrists, and others who bend from the waist and touch their toes. Whatever sort of exercise gets you feeling loose, give it a try when the pressure is tight.